EASTER SPECIAL 5 NIGHTS $3,750 OR 7 NIGHTS $3,999. Rental fee includes tax and cleaning. Email for this Special Easter Rate. Located in the upscale neighborhood of Holiday Isle....Destin's best location for white, sugar sand beaches, crystal emerald water, and great boating from your own private dock. The house is within minutes of all the restaurants, bars, water parks, shopping, groceries, etc., yet is situated on a quiet, residential peninsula of land between the Destin Harbor and Gulf of Mexico. The Holiday Isle Beach is much less crowded and the private gated beach access and Boardwalk is located right at the beginning of our street. This is a beautiful 3800 square foot custom built home with an open floor plan, plenty of baths, private pool, new 90' boat dock on the water, and a short walk to the beach access. You can even take a Water Taxi from our dock to your favorite restaurant, bar, or beach. On the Water, Private Pool (Heat Option$360/week), 8'x90' Private Boat Dock with composite decking wharf, very close to the beach, the Holiday Isle private gated beach access and boardwalk is right at the beginning of our street, and the home is only minutes to all of the restaurants, bars, shops, groceries, stores, amusement, golf, fishing, etc. You can even take a Water Taxi from our dock to your favorite restaurant, bar, and additional beach areas. 4 Full Bathrooms for plenty of privacy. Custom Jacuzzi suite with separate walk in shower in 3rd floor master. 2nd floor master bath features dual shower heads. Located on Holiday Isle, an exclusive beachfront community between the Gulf of Mexico and Destin Harbor. It's only 3 minutes from the heart of Destin. Spacious 2nd floor Den and Breakfast area. Large 2nd Floor Rear Deck overlooks the Private Pool, 90' private boat dock, Harbor Canal, and rear fenced yard. Also, a 3rd floor private balcony. Located on the water, one canal off Destin Harbor, approx. 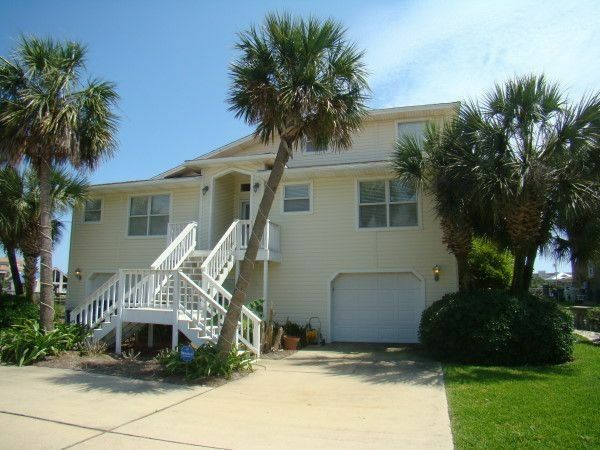 1350 feet from the beach, with private gated beach access, boardwalk, and shower. All linens are provided. Sheets, towels, wash cloths, etc. are provided with maid service at check in. Designer all leather sofas. Large flat screen tv with BluRay. Kenwood Stereo amp with CD player. Glass Dining table, Large bar, Small kitchen island bar. Large flat screen in den. Televisions in 4 additional bedrooms. Big Screen LCD TV in Den with Blu-Ray, DVD, and Stereo with CD Player. 2 Stereo/Cd. Game room and den. (2) The third floor suite has a private balcony. The second floor master opens up to the large main deck. Bring your boat or rent a boat, on the harbor, and dock at our new 90' wharf. Includes water, electric, and fish cleaning table. Blue LED glow lights and LED Flood lights to attract fish at night. (3) There is a large deck with table, chairs, lounges, and BBQ pit on the second floor. Large bedroom, bathroom, kitchenette, and spacious den on the ground floor. We could not of chosen a better place to stay. Everything was absolutely incredible, from the to fully equipped kitchen, Pool , Dock to the clean and well maintained property ! The house is decorated wonderfully, with all the Bedrooms very comfortable and nicely furnished! We had 3 families and everyone had such a incredible stay. The Pool was one of our favorites as we were able to enjoy in the evenings watching the Kids swim after Dinner! I brought my 24 ft. boat could not of worked out better at the Dock, with a nice Cleaning Station with power and water! We were able to access the Bay in minutes to go Fishing , Crab island and the Thursday Night Firework Show. Its location is perfect for all the good restaurants. Plenty of parking for the Vehicles. We've booked it again in 2018 and Cant wait to return! We had an even better time on our second visit here! (We came for our 40th anniversary 5 years ago.) Thanks for the heads-up about the Thursday night HarborWalk festivities. The live music was great and were able to see the fireworks show from the table at A.J. 's Restaurant. Taking the water taxi was a great option, since parking was at a premium there. We rented a pontoon boat to go out to Crab Island, and it was great to load and unload from the back dock. The Destin beach is always a plus - the sand and surf are so beautiful! All of the grandchildren loved the pool and the gameroom. We even celebrated the 2-yr. old's birthday - got some beach pictures and some in front of your lovely home. A tripod with a remote made it a lot easier this time. Cannot thank you enough for allowing us to all stay in the same place. Oh, and of course my husband took 2 fishing trips - 3 grandchildren on the Sweet Jody, along with 4 adults. It just seemed appropriate to see "Finding Dory" at the movie theatre in Destin Commons, which is a very nice mall. It really was a fun vacation! Many thanks!!! We had a wonderful time at this home for our September family vacation. We had 8 adults and 3 small children, the house fit us perfectly. We loved the pool and the beautiful view of the water. We loved the private dock, the water taxi picked us up and dropped us off right in front of the home. Our only complaint was that the beach was a bit further walk than we would have like (especially with small children) and the beds (besides the master) were much too small. They were advertised as queens but they were doubles. Other than that, we loved this house! We are glad you had a great time at our home! We pride ourselves in providing exactly what is described on our site. All of our beds are king and queens, except for the full size pyramid bunk beds in the first floor bedroom. We will also be adding another king bed in our second floor master bedroom this winter. We provide a large beach wagon and stroller for our guest in the garage. The Holiday Isle gated beach access and boardwalk is located right at the beginning of our street. We hope you and your family can stay with us again! Several Waterparks, Go-Cart Tracks, Zip Line, Rock Wall, Amusement Parks, Destin Museum, Grocery Stores, Target, Super Walmart, Home Depot, and many Fine Restaurants and Bars are all within 2 miles. Additional Golf Courses, Outlet Malls, Bass Pro Shops, Dolphin Shows, Fishing Pier, etc. are within 5 miles. The home is located on Holiday Isle, directly on the water, one canal off Destin Harbor, and only 1350 feet from the Beach, with Private Gated Beach Access and Boardwalk. It is located in a very exclusive residential neighborhood located on a peninsula between the Gulf and Destin Harbor called Holiday Isle. PLEASE CHECK OUR CALENDAR FIRST FOR AVAILABILITY, AS IT IS UPDATED DAILY. Please Note: Saturday may be marked as unavailable due to overlapping Check-ins and Check-outs on Saturdays. Minimum Rental age 26, Families Preferred. Sorry, No Weddings or Receptions. All Rates are subject to change, until receiving a confirmation booking. Holiday rates may be higher. Private Gated Beach Access, shower, boardwalk located at the beginning of the street is 4-5 min walk. Bicycles and beach wagon are provided in the guest garage. OUR POOL IS HEATED VERY WARM TO 88 DEGREES ($340 Optional) Heat is usually not needed May thru October 15th. IMPORTANT--All guests are required to complete a rental application and pool/liability forms. These forms must be received within 3 days of booking, or your reservation will be CANCELLED. Rental forms will be emailed direct to guest in Word Format. All guests shall be liable for any damages, to the property, that exceed the $600 damage deposit and all costs incurred while accommodating incoming guests.